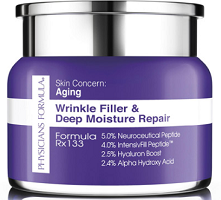 FREE Full-Size Physicians Formula Wrinkle Filler & Deep Moisture Repair! Set your alarms or mark your calender for 5pm EST, 3/13/13 because Physician's Formula will be giving away FREE Full-size Wrinkle Filler & Deep Moisture Repairs on their Facebook page! They will update their Facebook status with a code word at 5pm EST. Be one of the first 1,000 people to enter that code word into a form to score this expensive freebie!